I know it feels a bit like déjà leopard-vu all over again, but the new animal-print trend is not the same old thing we saw a few years ago. These days, leopard is tame enough to be a house pet, however you can also find all kinds of new-school leopard, cheetah, and other animalia clothing and accessories roaming around the online shopping zoo. Really, this year brings on tons of common, wild-animal prints like cheetah, zebra, tiger, and python…but if you look around, you also will find clothing that features every animal from butterflies to butterball turkeys. What is different this time around? The newest, trendiest designs are like animals on acid. Online sites offer clothing decorated with fun, imaginary swirls and abstract pelts that look like they must have been created by Alice after she stepped through the looking glass. Oh, you can find elegant, realistic-looking items, like standard leopard prints, too... and these natural styles are on trend. But, if you want to wow your wardrobe, look for fabrics with digitized animal patterns, snakeskin prints mixed with florals, cheetah skins mixed with chains, or other kinds of colorful incarnations begat by some lively Photoshopping artiste in the style of Roberto Cavalli. There are two new manifestations that are a bit trendier than the traditional animal prints you remember from several years ago. 1. The first trend includes large portrait photos of animals, usually found on tee shirts. Most of you should avoid these digital animal tees because you’re old enough to know better. 2. The second trend is like repeating polka dots, but the dots are actually silhouettes of horses or birds or jaguars... or, as in the photo of the black "dotted" dress... little squirrels. Sometimes, the animals are large, like the repeating sheep silhouette on the sweater (in the main photo), but the best style for Boomers… the style that is easiest to wear... has prints with little (almost imperceptible) critters all over the fabric. Very cute. Very wearable for women over 40, 50, 60, or 70. These prints come across as subtle and elegant. Well, there are exceptions to every rule… however, I’m talking to most of you... suburban women who want to look stylish without looking like fashion fools. You know I'm just trying to help you, right? I know what you want... you want the same things I want... to stay stylish without looking like you're wearing your granddaughter's clothing. 1. Dream Prints: If you see a fabric that is so subtle that you have to ask yourself, “Is that a paisley print, a peacock-feather print, a snake print, or an abstract modern print?” you will probably look good wearing clothing made from that fabric. This dreamy type of digital graphic becomes a modernized version of camo. (No, don’t wear camo.) What I mean is that this blurry, dreamy style of animal print works like camouflage to hide imperfections in your body. You will love this type of print and you can certainly wear it anywhere. 2. Combo Animal Prints: Most digitally manipulated animal prints (usually combining flowers with animal skins) are gorgeous. Just make sure that the fabric has colors that are flattering to your skin tone. 3. Natural-Looking Animal Prints: Every woman can wear realistically styled animal prints. I think leopard actually looks better on older women than on younger women. (Leopard reminds me of slinky, old-time Hollywood actresses.) However, the trick is to wear leopard, zebra, cheetah, snake, tiger, or whatever without going overboard. When you're older, if the print is subtle, you can wear more of it. If the print is flashy, you should wear the print in small accents. This is not always true, but if you start with this rule, you can adapt it to fit your body type and personality. Again, these rules are just my rules. I am not a fashion designer or stylist; I am an artist… but I like to think I’m an expert at visualization. Hey, you may be the exception to the rule, but only you (and your daughter) can make that determination. 2. 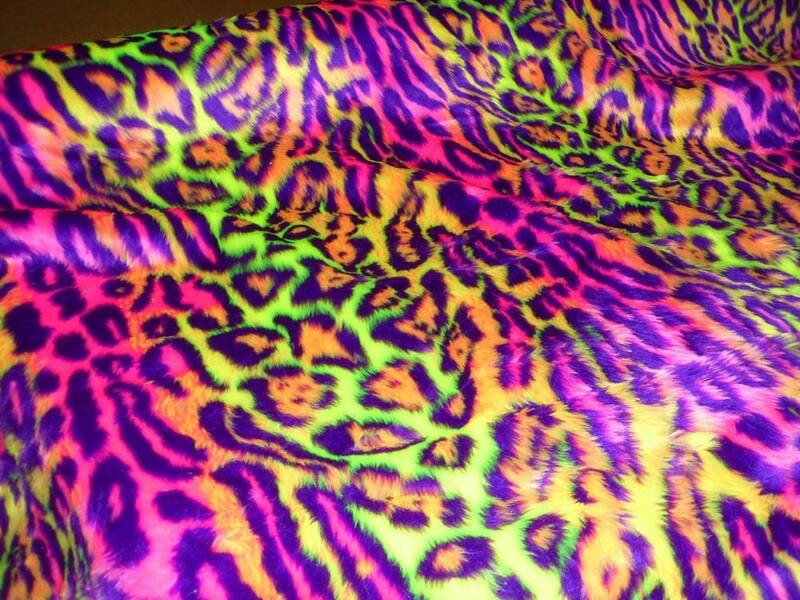 Bright Animal Prints: If you are old enough to remember neon animal prints from the 80s, you are too old to wear them now. You can go with unnatural colors, but they need to be elegant, not jarring. Diane von Furstenberg is one of the few fashionizers who knows how to colorize prints the right way. 3. Swinging From the Vines: If you start to feel like you belong in a Tarzan movie, your ensemble is too wild for you. 4. Ugly Animal Print Dresses: Always make sure that the print doesn’t attract attention to your flaws. For example, don’t wear a zebra-print belt if your stomach is fat. Don’t wear pink-leopard shoes if your feet are huge. And, do think about where the sleeves and hem end... that's usually a spot where people's eyes will rest. 5. Animal Print Leggings and Jeans: This is a gray area, because subtle prints might be cute on you, but if the leggings or pants are overpowering or too bright or your granddaughter is wearing the same pattern, the pants are probably going to be less than flattering on you... even if they look fine on some teenage girl. 6. Animal Print Nails: Decorated nails are cute on younger girls and women. You don’t need them. Well... I'm amending this. If you work in a very artsy environment and you know what you're doing, you can ignore my mother's wishes. It's your body. Fortunately for us Baby Boomer chicks, we live in a time when we can go online and order clothing from New York or London. Sure, it would be better if we could fly to these places and try the clothes on in the store, but who can afford that these days? And, who wants to deal with skinny, snooty salesgirls anyway? If you can’t find what you want in your size or price range, you can always update your wardrobe with a trendy printed scarf or a cheap leopard-print watch. Main Photo: Animal Prints for Women of All Ages: Very, Louise Green, Debenham, Very, Accessorize, Accessorize, Louise Green, East, Debenham, Louise Green, Debenham, Very. Animal Print Trousers for Women Over 40 50 60: Betty Barclay. How to Wear Animal Prints - Older Women: The Vestry, M&S, M&Co. Natural Leopard & Dream Print Skirts: M&Co, Hobbs. Leopard Prints are Great for Older Women: Dash. What do you think of this article? Leave a message in the comment section at the bottom of the page. If you like our style, repin this article. I love your blog, keep the good advice coming! Great job addressing my fashion issues! Where could I buy the leopard print pants in the picture with the coral shirt? Please let me know via email. Thanks. The leopard pants are from Betty Barclay in the UK. I'm not sure they ship internationally. You'll have to check. Hopefully, someone in the US will come out with something similar. Those trousers are hugely popular. i do not have e-mail at this time, but you are wonderful. thank you so very much for this information. continue. keep up the good works for us. How can you live without the internet? It's almost impossible to live without email once you've gotten used to it. And, I love online shopping. I'm glad you found what you were looking for. Let me know if I can help you in the future. Sure. That's fine to use the photos, but you should backlink to the article because I can only use these photos if I give copyright credit. Unfortunately, a recent WP update stripped some of the photo credits, but most of them are there.